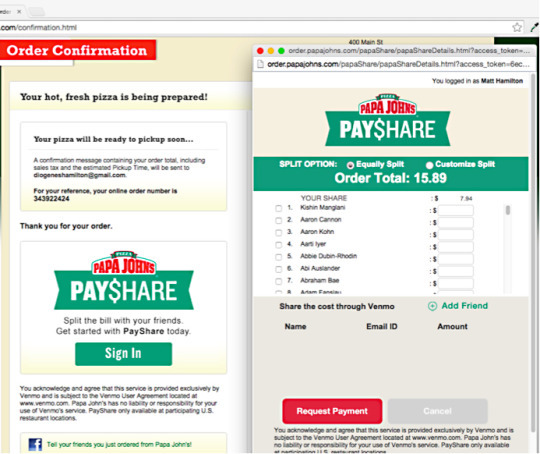 Papa John’s is taking another step in the digital direction. The pizza chain recently introduced PayShare, a digital platform powered by Venmo that allows customers to immediately split their pizza bill. The digital offering will be available with all online and mobile app orders. According to Venmo, customers were already using the app to split pizza costs, making the pairing a natural one. In fact, the payment app says the pizza slice is the most often used emoji on Venmo. The introduction of ‘PayShare’ is just the most recent development in the pizza industry’s battle for the digital market. Domino’s customers can order via smartwatch and the company now calls itself an “e-commerce company that sells pizza.” Meanwhile, Pizza Hut is developing a connected car that allows drivers to purchase pizzas on the road. Digital and mobile orders make up about half of all sales at each of the major pizza chains, with Domino’s, Pizza Hut and Papa John’s eager to uncover any tech that will boost that percentage just a few points.